Recently over on FreeMoneyFinance an author claimed that senior citizens control 'most' of the nations wealth. That didn't sound right to me so I decided to investigate. I found that seniors actually hold about 1/3 of the nations wealth. The Survey of Consumer Finances 2010 breaks down net worth by family based on age of households. They give the median and mean net worth for families in each age range. I can use that and the total number of people in various age ranges (table 1 from the Census CPS ) to figure the total net worth for people of different age groups in the US. When we then add up the total net worth we can find the distribution of net worth based on age of household head. 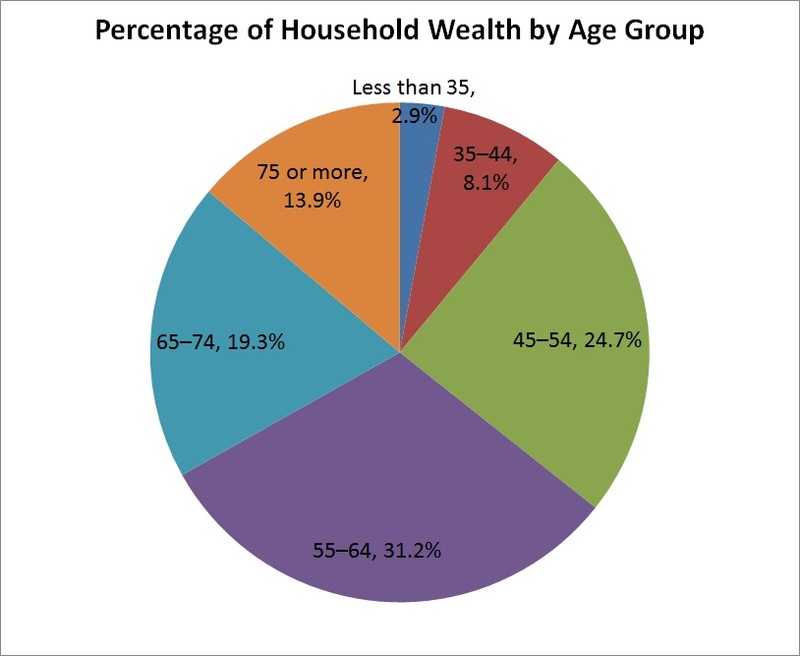 As you can see the younger families hold very little of the total wealth and the older families have most of the money. I expect that this is simply due to accumulating money over time. Seniors do hold a disproportionately high portion of the nations wealth. People age 65 and older have just about 1/3 at 33.2% of the whole. At the other end of the spectrum families with heads under age 35 have just 2.9% of the wealth yet they represent 22% of the population.